High I'm Jeeps. I'm new to the forum. I started out with a Pit Boss 820. Now I have a Louisiana Grills CS570. Not overly thrilled with that. By next spring I plan on owning either a Yoder YS640 or a Mak 1 star. I love the heavy build of the Yoder, but I've been reading a lot of complaints about its temperature swings, and pellet consumption in cold weather. Any info on this would sure be aprecciated. 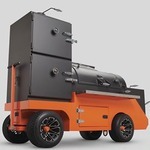 I also cook on kamados including a Primo Oval XL, a Pit Boss K22, and an old Grill Dome.